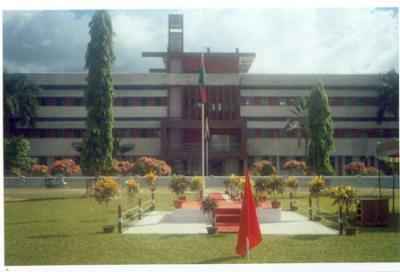 Marking golden jubilee in 2014, Sainik School Goalpara Situated at 18 km from Goalpara town in Goalpara-Matia-Dudhnoi road, Assam which was established on November 12,1964 under the ministry of defence. The motto of this school is Everything is Possible. It is a residential School for boys, providing Public Education with a military bias. It is affiliated to the Central Board of Seccondary Education, New Delhi. The strength of the school is 666 Boys. The Primary aim of the school is to prepare boys academically, physically and psychologically for entry into the National Defence Academy (NDA) at Khadakvasala, Pune. However, it fully equips a student to pursue any other career with distinction. Character, team spirit, a desire to serve the country with dedication are the qualities sought to be promoted by training at this school. A) To remove regional imbalance in the Officers cadre of the Defence Services. B) To develop qualities of body, mind and character which will ensure the young boys of today to become good and useful citizens of tomorrow. C) To bring Public School Education within the reach of common man. Admission Procedure and Fees Structure in Sainik School Goalpara : Only boys are admitted in class VI and IX between the age group 10-11 years for class VI and 13-14 years for class IX as on 2nd July of the year of admission through all India Entrance Examination normally held in 3rd week of January followed by Interview and medical examination held in April/ May every year.Prospectus and application forms may be obtained from the school on payment of Rs 300/-(Rs 200/- for SC/ST candidates)by bank draft or postal order in favour of the Principal, Sainik School Goalpara,payable at State Bank of India,Mornoi (Code-9148)/Goalpara Post Office respectively.Boys finally selected are called for admission in June every Year and is a fully residential school. Approximately Rs 29,000/-per boy per annum,excluding diet charges. Liberal Scholarships are sanctioned by the state and central Governments. House system in Sainik School, Goalpara : There are total seven houses for accommodation. These are divided in three groups- sub-junior, junior, senior. Class VI and VII are sub-juniors. Class VIII and IX are juniors. Class X to XII are called seniors. ABHIMANYU HOUSE - This house was named after Arjun's son Abhimanyu. This house accommodates Class VI students. BHASKER HOUSE - This house is for Class VII students. ANIRUDHHA HOUSE - This house is for Class VIII students. CHILARAI, LACHIT , LOHIT , UDAYGIRI - These are the senior houses. These accommodates class IX to class XII. Besides these seven houses there is a fully functional mess of inhouse strength of 1000. This makes it on of biggest eating area of region. There is a fully functional state of art auditorium of strength of 1100. The school building is divided into two parts- Main building and Science Block. Main block is a 3-story building having classes for class VI to X. All offices of the school are situated in this block. Science block has classrooms for class XI-XII. This block has various science laboratories. Sainik School Goalpara has a fully functional wing of NCC. The 27th Coy of NCC is located inside school premises to train the cadets. Each friday after , there is NCC classes for 90 minutes. The school has very active participation in REPUBLIC DAY PARADE, NEW DELHI. The cadets are entitled to get NCC 'A' certificate after class X and NCC 'B'certificate after class XII. The main motto of the school is all round development of the cadets by making them tough - both physically and mentally. How to reach Sainik School, Goalpara : Assam State Transport Corporation (ASTC) operates frequent bus services from Goalpara town to Guwahati via Sainik School.The nearest railway station is New Bongaigaon approx. 80 kms. away and there is regular bus service from New Bongaigaon to Goalpara Sainik School. Guwahati railway station is approximately 130 kms. away and regular bus service is available.